Up along Skyline Boulevard between Snake and Shepherd Canyon Roads is a long section of crumbling roadcut. 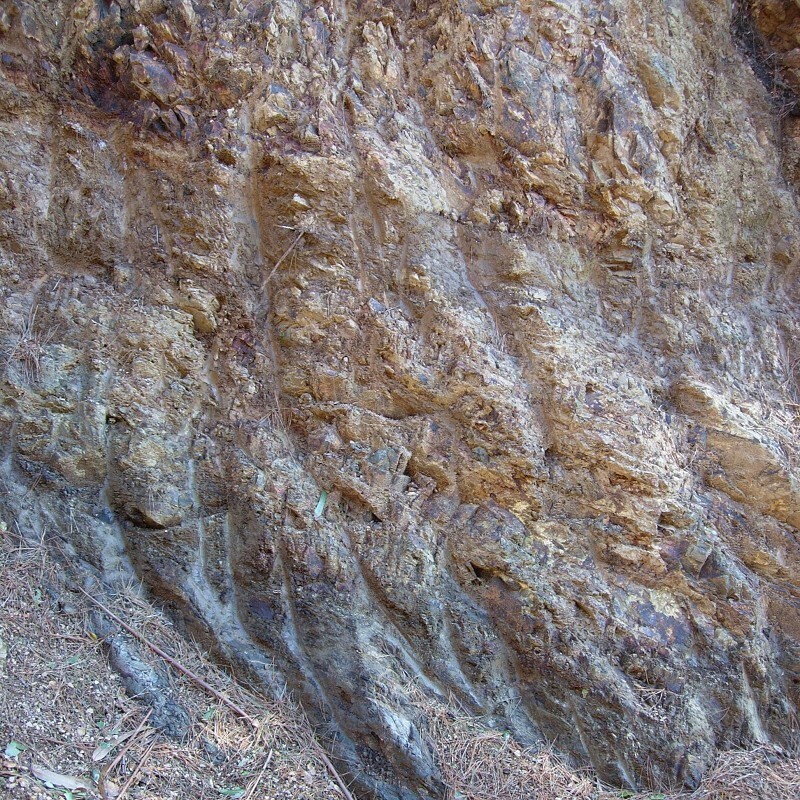 The rock there is mapped as brown mudstone that has been questionably assigned to the Sobrante Formation. OK, enough of that. What struck me about it is how weak it is. This exposure is an excavation, probably for a garage, dug a good four meters deep into the hillside. And all the way in, it consists of this crappy stuff. Click the photo for an 800×800 closeup. The bedding slopes to the right; you can see three different units in this shot which is maybe two meters high. On top is a blocky layer richly stained with iron; the middle is lighter and crumblier, and on the bottom is a dark claystone. The big vertical streaks are backhoe marks, that’s how soft this material is. You can pluck it apart with your hands, scratch it with your fingernail. The dark layer is as creamy as chocolate between the teeth. As I stood there, the rattle of falling pebbles was nearly constant. Covered with soil and shaded by trees, this rock will stay in place all right. But excavate into it and it turns to dry rubble. The roadcut is a steep slope of loose shale bits, topped with a meter or so of fresh strata and a big tangle of exposed tree roots dangling in the air. When the next big earthquake hits Oakland, expect this stretch of road to be buried and barred by fallen trees. This entry was posted on 23 February 2010 at 11:00 pm and is filed under Oakland hazards, Oakland rocks, Sausal Creek watershed. You can follow any responses to this entry through the RSS 2.0 feed. You can skip to the end and leave a response. Pinging is currently not allowed.